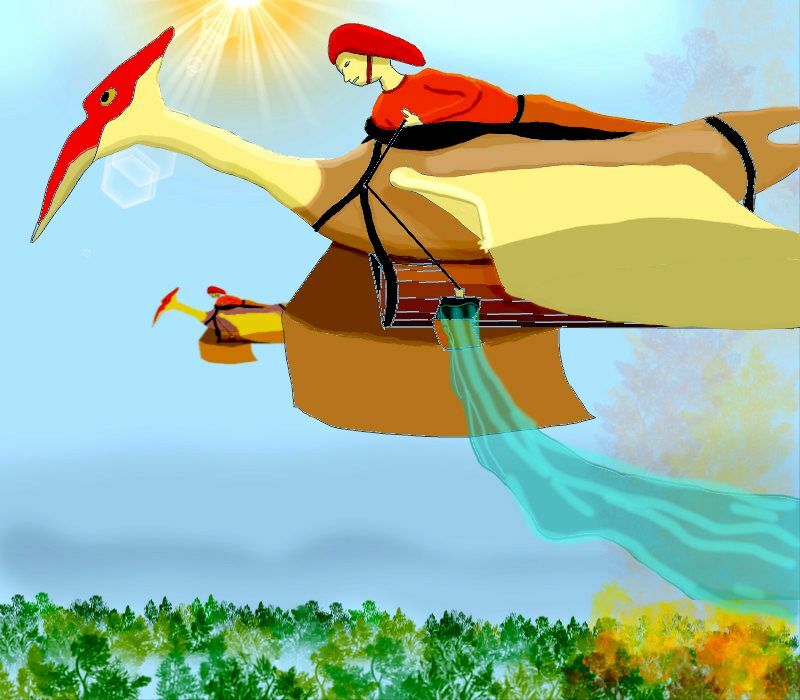 The Ninth Code of Dinotopia reminds us to, Exercise Imagination. There's no better way to enjoy putting this into practice than to sketch up scenes that could not even exist today (at least, not yet...). The fun part is, you don't have to be an artist. Neither need we call our creations "art", for not doing so buys us precious freedom. Nor are expensive materials necessary -- a pencil, a good eraser, and some paper will get you started. And if you're on this forum, obviously you have access to a laptop or similar device. 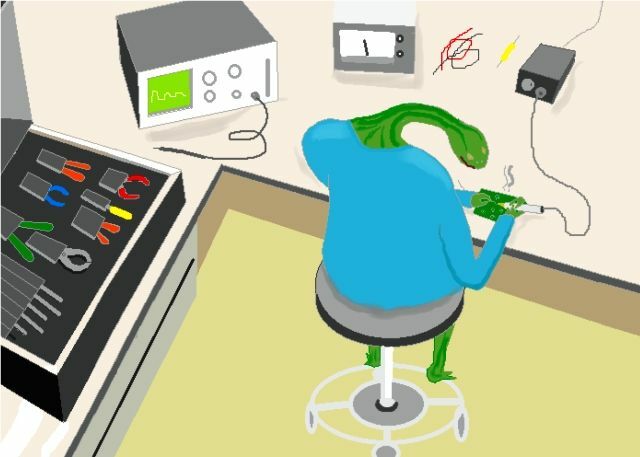 You can do a lot with it, while its Eraser tool and Undo button are your friends! Far from Extinct, or, And they call an old computer a dinosaur... With thanks to cptstarlight and Rosa . That could be me above. If I tried to be an artist, it would redefine, "starving artist." 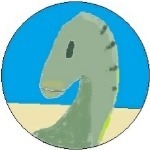 Rather than encourage you my reader to go ahead and try your hand at sketching a little Dinotopian fan art, I'll point you to a real source of encouragement: Mr. Gurney himself. 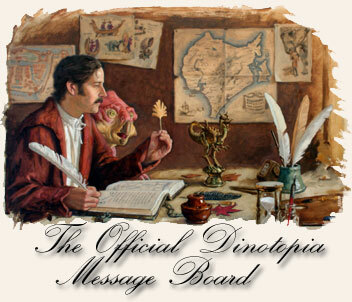 Go to www.dinotopia.com, click on About, then FAQ, and read most of the way down (sorry there's no direct link). 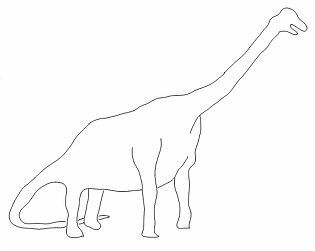 If you're using pencil, see my review of "Draw-A-Saurus" for some ideas. I did my early work, including the drawing above, with MS Paint. Unless both your imagination and your sense of proportion are much better than mine, likely you'd want to start with a reference photo. 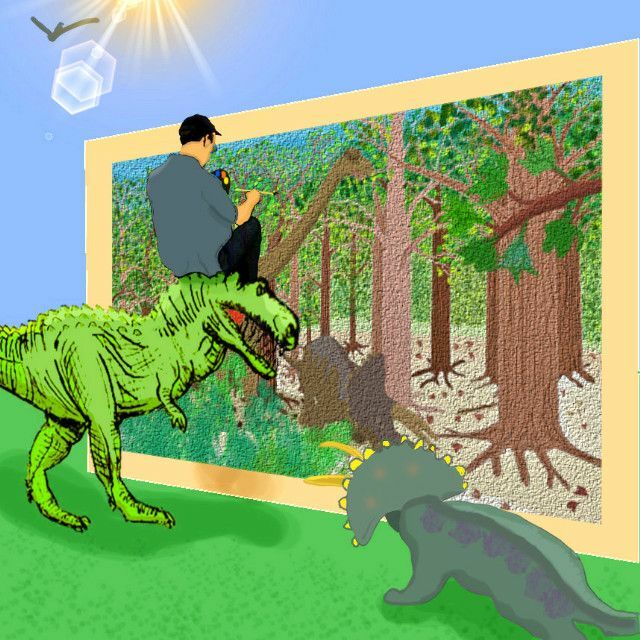 As described in the thread here, a dinosaur "photo" is inevitably another artist's work -- thus we need to acknowledge this as well limit how much we take from it. For this demo I'm using a brachiosaur image from dinosaurios.org. You could also use a toy dinosaur for your reference! Of course we're free to make changes within the realm of plausibility. For example, I've got the brach's tail folded around instead of straight back, to save space. Being rather timid at this whole thing I start sketching with single-pixel wide lines in 25% grey. MS Paint's pencil tool makes rather fat lines even at its thin setting, so I combine short line segments instead. You can move and alter them before fixing them in place, another advantage. One thing I've learned is how nature abhors a straight line. Thus, the segments are ever changing direction, forming compound curves. Also, animal and human figures need bumps in their skins to acknowledge the muscles underneath. There's nothing like a brach! 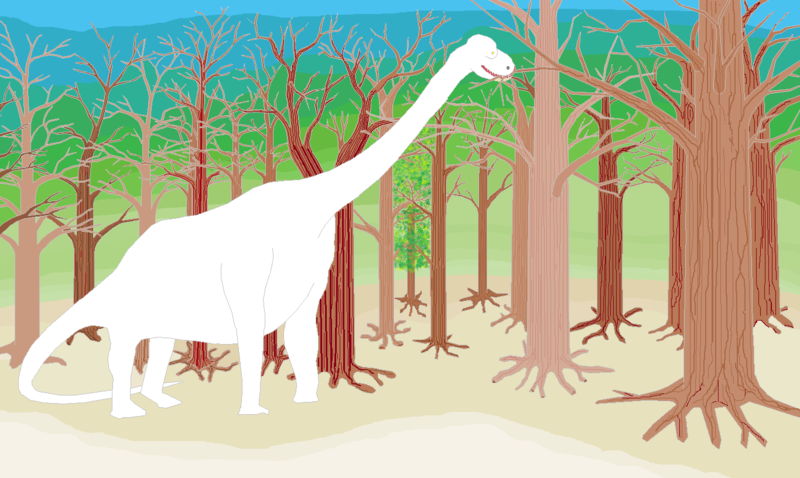 But what's a brachiosaur to do without trees? As before, the nearly invisible lines have been darkened for this image. Mr. Gurney made his brach tan in his book, Journey To Chandara (page 52). This took me far longer than anything I've done here. To me it's just OK -- yet I can't pinpoint exactly what might improve it other than tossing it and starting over. In any event, please enjoy the picture and share your own creations. You need not be a professional artist -- certainly I'm not one -- to have some fun in this sandbox. Don't toss it, please! You must be a perfectionist if you're considering tossing it. 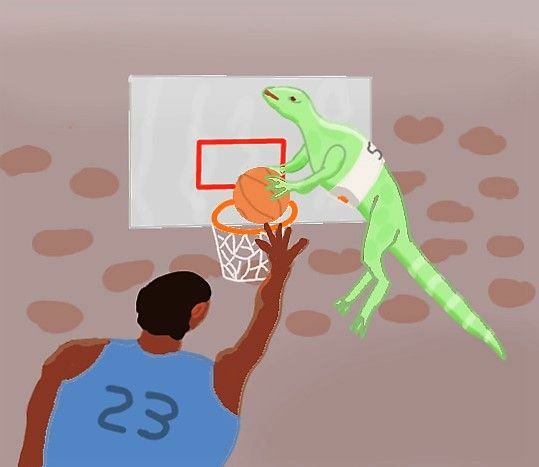 No one else I know can do MS Paint as well as you do. I personally think the picture is awesome. I especially like all the colors in the background. MS Paint is intuitive to pick up and use, yet its limitations become increasingly annoying with experience. Ever since Applejack introduced me to GIMP I've been gradually transitioning. Its power is comparable to Paint Shop, and some even compare it to Photoshop (although that may be a stretch). Regardless, you can do things in GIMP such as coloring pencil sketches and drawing fuzzy shadows, that are difficult to impossible in Paint. Unfortunately, it's quite intimidating at first glance -- I needed to "hold my nose" and stay with it until it began making sense. Applejack's GIMP Experimentation Thread is a helpful resource, and my first from-scratch GIMP piece appears here. On top of all this, GIMP is open-source and available on many platforms, making it accessible to even more folks than MS Paint. Because I switched photo hosting services, sometimes you’ll see an square image with a kitten and the legend, Click for Photos. These link to my old service, so there’s no need to click there. 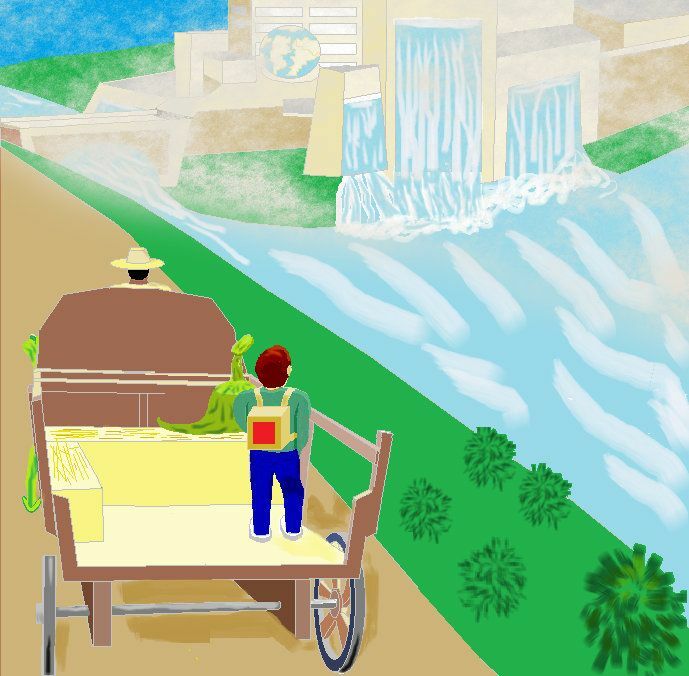 From the old thread, Gone Fishin': It's known that dromaeosaurs dwelling in Waterfall City have learned to live with people and are provided (hopefully enough) fish to satisfy their carnivorous instinct. Perhaps some of them would like to go out and catch a few on their own now and then! Oh, well -- Cavs in 6. I haven't read through that RP, but I think it's pretty awesome that you're creating art pieces for an RP story. Combined with TTV's placement of music in there, and I now have some pretty good ideas for what to put in any prospective fanfic I may want to do in the future. Aric, I'd love to see what you might come up with (of course we know how RL gets in the way....). A friend suggested that my brach piece needs a few foreground objects to really make it work. 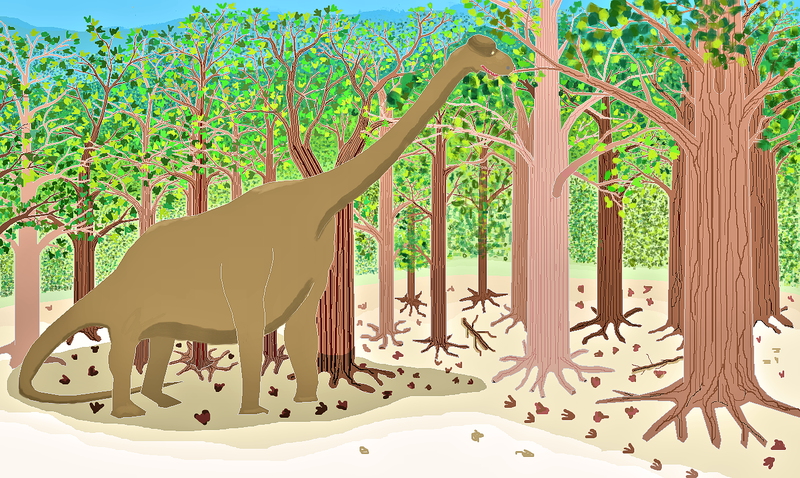 Thus, I brought it into GIMP and placed another dinosaur and an additional foreground branch on a new layer. Layers makes the process a lot easier! The Triceratops is based upon a toy dino. Is it just me or are you getting better? LOL! I really like the trike. Everything from the counter shading of the body to the separate coloring of the horns. It's all very well done. In addition to the trike, perhaps a bush or something in the foreground is what your friend suggested? As if the cameraman is hiding in the foliage and is peering out to take a shot of the saurians? Six Flags Great Adventure's Safari ride brings guests through a park where the animals roam free (except for the large carnivores, which of course are beyond fences). 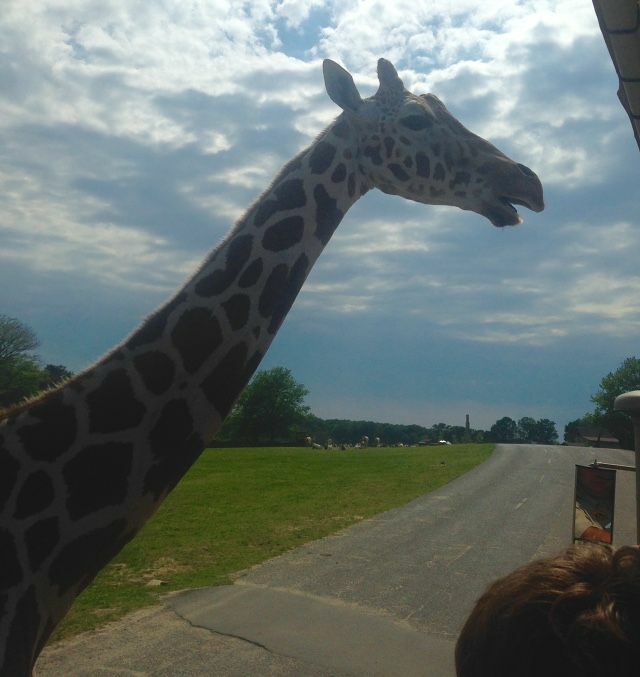 So occasionally a giraffe might wander over for a visit. 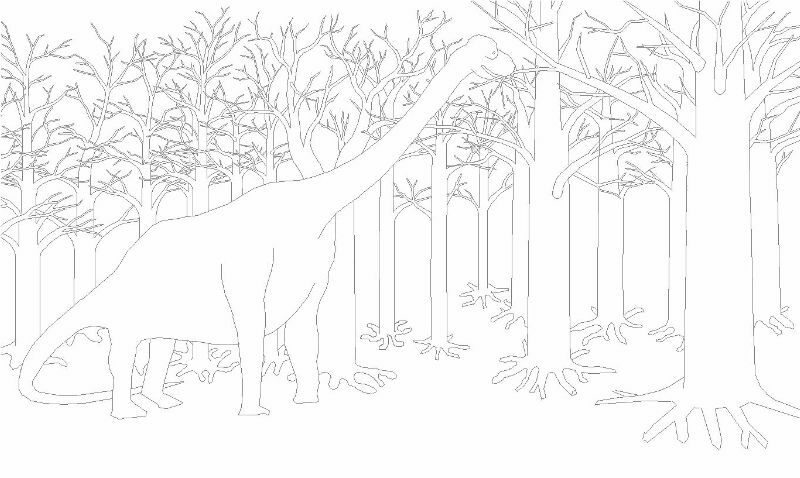 How did you replace the background after you removed the giraffe? Did you use a similar technique to the cut and move thing in MS Paint? Or did you use a cloning tool? 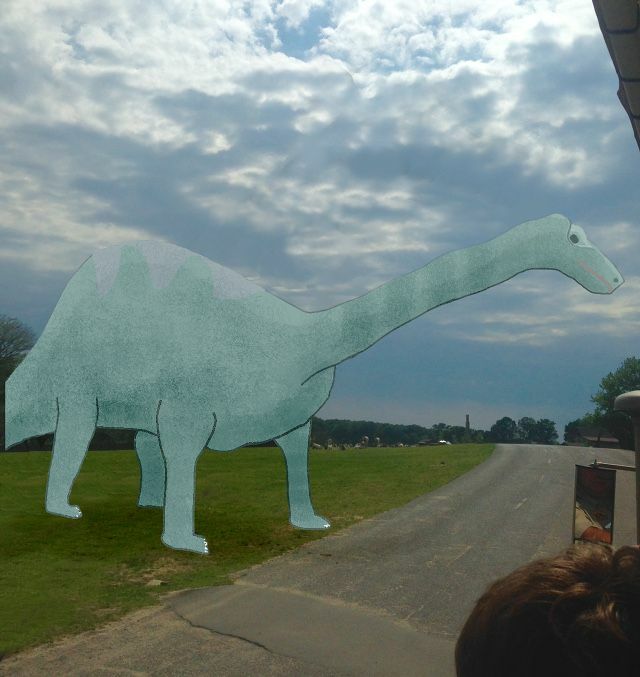 It's quite observant of you to notice that some of the background needed restoration after the giraffe was removed. Yes, I used the GIMP cloning brush. It was incredibly easy to do with this nondescript background of sky, trees, and grass. Using a softer brush outline (such as 25 or 50% hardness) makes the cloned spots blend in better. With summer here it's brush and forest fire season. Let's do some Skybax fire fighting! Right now I have no Internet access at home after dumping Comcast, which is why I haven't been around. It will be a few more weeks before getting something else. I like the whole concept of fire-fighting skybaxes. A couple things, though. That log is huge. Once it's filled with water it becomes even more heavy. It's already kinda unlikely that a quetzalcoatlus could actually carry a human being. Honestly, the only thing that it could carry would be a relatively large bucket full of water. And I don't think that would be effective at all. 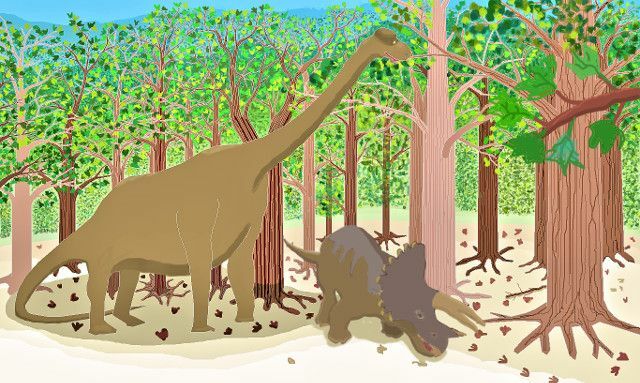 Secondly, my feeling is that Dinotopians likely keep the underbrush well-kempt either through the voracious grazing of the island's herbivores or through controlled burns that clear overgrown areas. Still, the concept is interesting, and if anything those guys probably do exist, but to put out house fires rather than forest fires. Now that's an understatement if there ever was one. Their customer service is better than it used to be (which isn't saying much). The worst part for me was their monthly charge which was my largest expense after rent (really!). Fortunately another choice is available in my neighborhood -- most folks have no such luxury. For another two weeks I'm living on coffee-shop WiFi until that's installed. 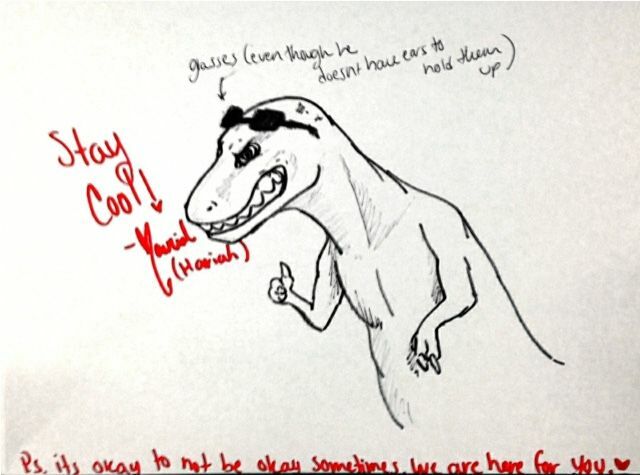 An associate at work, upon finding me in one of my miserable moods, went and drew this picture to cheer me up. She allowed me to post it here for all of you, and I just wish she would join us on the board. She and her mom are both Dinotopia fans. With just a few lines she manages to achieve a feeling of depth which I've yet to master. And it did cheer me up! 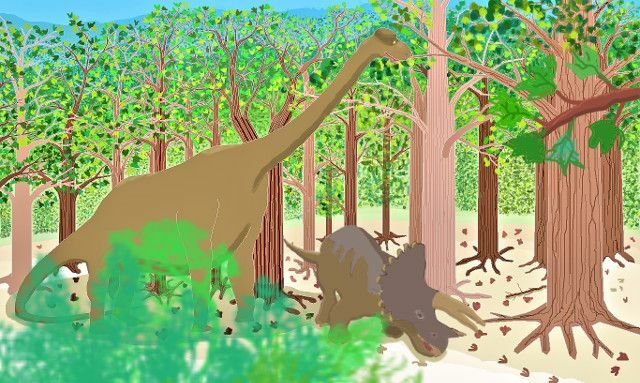 Here's my tribute to James Gurney, without whom there would be no Dinotopia (and by extension, no OMB). It's also quite a GIMP exercise in mashing up images using transparencies, with no fewer than five layers involved. GIMP's Perspective, Olify and Clothify tools turned my brach drawing into the wall mural. I'll admit to tracing the image of Mr. Gurney from his Watercolor in the Wild video. There he was sketching a tortoise into a pad on his lap, so I had to modify his arm position some. 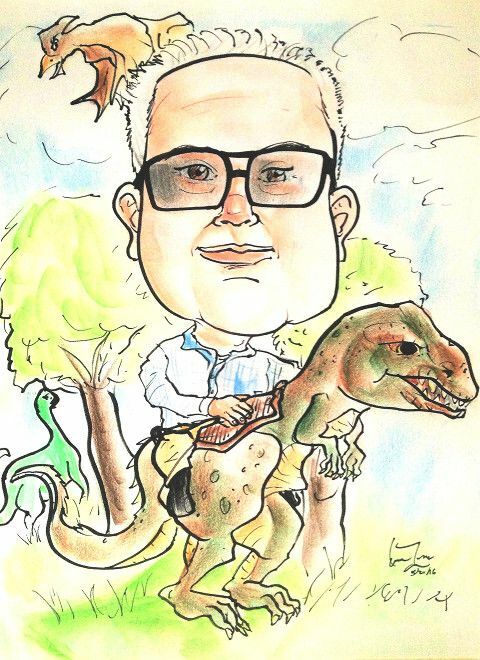 His mount would logically be a sauropod -- which is why I chose the juvenile T-rex instead. 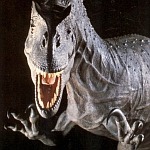 After all, this is Mr. Gurney's world so the rex had better cooperate nicely! 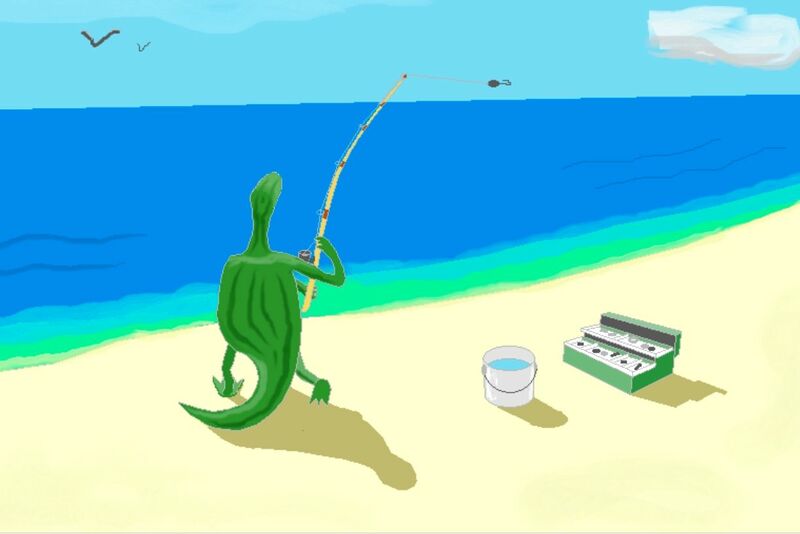 With foreground objects and background on different layers, applying cast shadows with the Burn tool becomes easy. Hope you all enjoy this one, it was quite the labor of love.